I'm a little pressed for time, okay? And I bet you are, too! But never fear, I will have more snarky commentary in the future. Wednesday morning, I drug myself out of bed on time for a change so I could make myself breakfast, lunch and coffee before work. While in the fridge getting out things I needed for those, it came to my attention that I had veggies that really needed to be used soon. And I really hate wasting food. 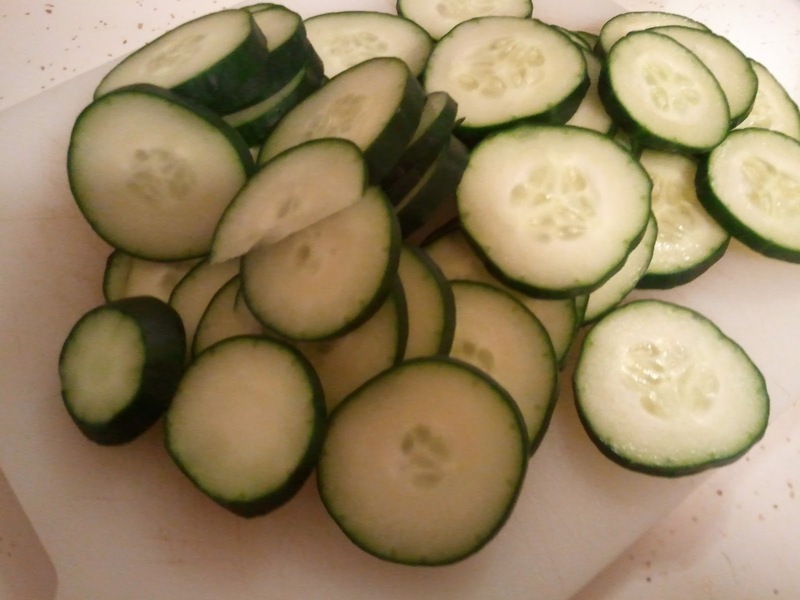 And chopped it into little rings. 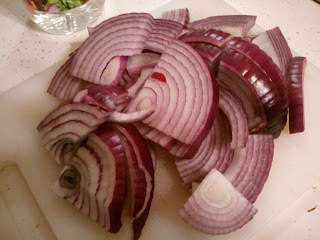 Then I took a red onion, peeled off the outside, and did the same thing. I tried to keep it all in one container, but my largest clean Tupperware available wasn't big enough. 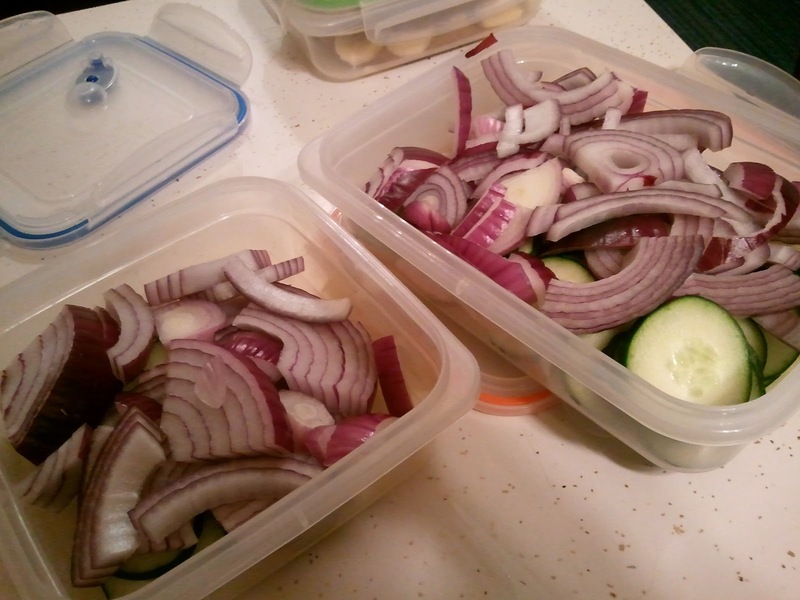 So I put part of each the cucumber and onion into each container. 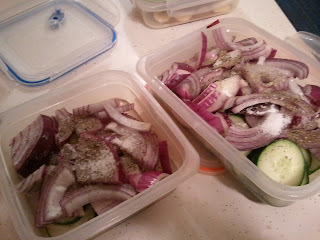 Added about half a cup of white vinegar to each, plus a tablespoon or so of sugar and a heavy sprinkling of cheap Italian seasoning. Then filled the containers nearly to the top with water. These should be pickled and tasty by now! They take a day or so to really cure, but then they keep for several days afterward. My Grandma Eileen (hi, if you read this!) made these all the time when I was a kid, and now I love making them for myself. They remind me of warm summer weekends at her house. I'm going to go cry nostalgic tears now. You, go make some pickled cucumbers and onions while I do that. 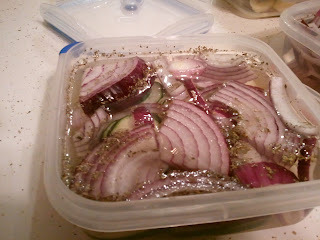 The onions will make you cry right along with me. Feel free to change up the spices a bit to get it right where you like it! 1. Combine all ingredients in sealed container and refrigerate at least 24 hours before eating. I make this all the time. I sometimes make it spicy those (jalapenos) and add carrots. Crunchy goodness. We too grew up with this summer feast. 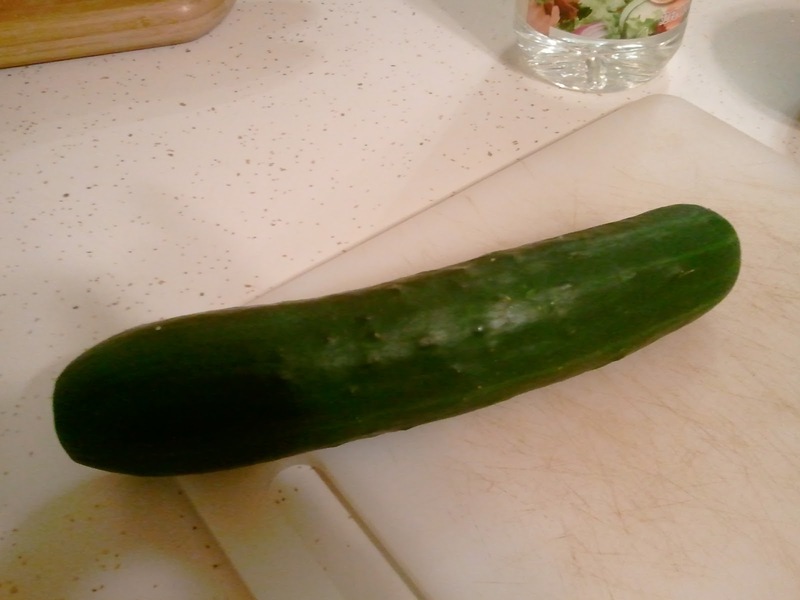 And you just reminded me I have 3 patiently waiting cucumbers in the fridge, just waiting to be pickled!